Ash Wednesday – March 6, 2019 at 7:00 PM: Ash Wednesday marks the beginning of the season of Lent with a reflective Ash Wednesday worship service that inspires us to consider the meaning of our lives and call us to recommit to our own personal spiritual growth during the days leading up to Holy Week and Easter. 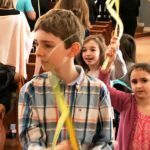 Palm Sunday – April 14, 2019 at 10:00 AM: On Palm Sunday, once again our NMCC choir will be offering a presentation of extra special music. This year, they are pleased to offer a collection of several stunningly beautiful anthems of composer Rene Clausen focusing on Praise, Thanksgiving and Love. Clausen, Professor of Music at Concordia College and director of their renowned choir, has been described as one of the very few composers having the ability to bring music from the “heart”as well as the mind and the spirit onto the musical page. Please join us on April 14 for an experience of exquisite music. Maundy Thursday Fellowship Supper and Service of Remembrance – April 18, 2019 at 6:00 PM: Join in our family-friendly potluck supper and service of remembrance this Holy Thursday. We remember the Lord’s Last Supper and His prayers in the garden for guidance and strength. We will share communion following the meal. 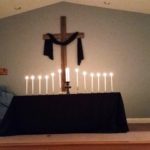 Service of Tenebrae on Good Friday – April 19, 2019 at 7:00 PM: In this Tenebrae (Latin for “Shadows”) Service, the most somber day of the Christian calendar, we follow Jesus all the way to the cross. This deeply moving service of lessons and hymns, accompanied by the encroaching darkness, recalls the trial and death of Jesus. We invite you to linger and contemplate all that it means for the hope of the world and the transformation of your life. Our friends from First Congregational Church in Madison will join us in presence and participation. 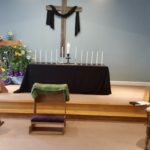 Prayer Vigil – Good Friday – April 19 at 8:00 PM through 6:00 AM, Easter Morning – April 21, 2019 at 6:00AM: Our Prayer Vigil begins after the Tenebrae service. You are invited to spend an hour praying in our sanctuary, which is open all weekend until early Easter Sunday. To ensure continuous coverage throughout the Vigil, we encourage you to sign up for a specific time to experience the quiet peace of the sanctuary. Our tradition is for this to be a solitary or with friends or family experience. Someone will be in the church office during the night hours. Easter Sunrise – April 21 at 6:00 AM (Cemetery) and 6:30 AM (Beach): Join us as the dawn breaks and we lift up our hearts with music, readings and prayer, celebrating together God’s gifts of new life and wholeness. There are two services this year. Our traditional “home” service will be led by Deacons at Summer Hill Cemetery at 6:00am. The cemetery is located less than a mile from NMCC on the right on Route 80, east of the 79/80 Circle, just before Summer Hill Road. First Church, Madison, and NMCC will offer a shared service on Long Island Sound at the Madison Beach Hotel at 6:30am, led by Rev. Matt, and Revs. Todd and Sarah Vetter. Easter Sunday – April 21, 2019 at 10:00 AM: Join us in this communion service of celebration and the hope of everlasting life. The triumph of the Christian story is celebrated in this Festival of the Resurrection. 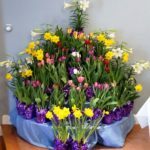 Our sanctuary will be filled with beautiful flowers, joyous music, inspired scripture and a special message of hope celebrating God’s love for the world.